For the second time this season, the conference office has named co-offensive players of the week as White and Dixon were the recipients. Junior outside hitter White led the league in hitting percentage (.654) with her errorless performance against TTU and recorded one of two 17-kill performances in the league on the weekend. The native of Frisco, Texas led the Longhorns to a three-set victory behind her 5.67 kills/set. All-time, White has now earned double-digit weekly awards (10) behind her two this season. Junior Micaya White has earned her second Big 12 Offensive Player of the Week honor! 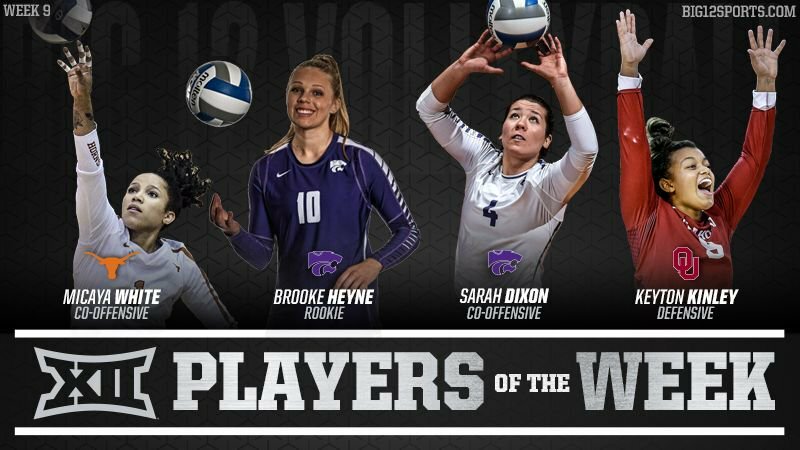 Dixon spearheaded K-State’s 2-0 week that included victories over ranked teams in then-No. 22 KU and then-No. 24 Baylor. Dixon’s 14.29 assists/set topped the Big 12 over the week. The Wildcats’ setter registered the most assists in a three-set match (47) in the league this season. This week’s award marks her second this season and all-time. Kinley, back-to-back Defensive Player of the Week, led the Big 12 in digs/set with 7.00. She now paces the Conference in digs (178) and digs/set (5.74) in league play. She recorded the second-most digs in a three-set match (21) this season, behind only her 23-dig showing earlier in the season. For the second week in a row, @keyton_kinley4 has been named the Big 12 Defensive Player of the Week! Rookie of the Week honoree Heyne set a career-high in kills (15) against then-No. 24 Baylor after previously recording a career-high 12 kills vs. then-No. 22 Kansas. The Nebraska native posted 3.86 kills/set during the week, the most among Big 12 freshman, with a .467 hitting clip against BU. This week marks her first all-time honor.